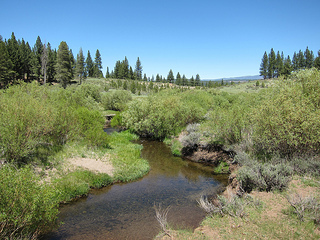 Martis Creek, which flows through the private Lake Tahoe area community of Lahontan. While golf might be the main game for many homeowners in Lake Tahoe’s Lahontan, residents of the prestigious private community enjoy an abundance of other family-friendly activities all year long. The 900-acre, exclusively residential community is nestled in the scenic Martis Valley, about five miles south of downtown Truckee and Interstate 80 and less than 15 miles northwest of Lake Tahoe on state Route 267. Initially developed in 1996, the neighborhood has about 500 home sites, which range in size from half an acre to nearly two acres. Like the neighboring community of Martis Camp, Lahontan is centered around a golf club, which is limited to 350 members who pay about $15,000 each in annual dues. The community is home to both an 18-hole and nine-hole golf course designed by former pro golfer Tom Weiskopf. In order to join the Lahontan Golf Club, members must own property in the community, although homeowners who do not golf can pay about $7,500 per year to belong to the Lahontan Social Club. Homeowners pay about $3,000 in annual dues, which fund the maintenance of common areas and roads and snow removal. Both golf and social club members have access to a fitness center, spa, and The Lodge, a central gathering place that acts as the community’s hub. Membership includes access to Camp Lahontan, a family-focused facility with swimming pools and basketball, volleyball, shuffleboard, and tennis courts. Camp Lahontan offers a broad range of year-round programs and classes for children, families, and adults and organizes dozens of events in the summer months. When the snow starts to fall, residents don’t need to travel far to take advantage of the fresh powder. The closest ski resort, Northstar, is less than 10 miles away, while Squaw Valley, Alpine Meadows, and Sugar Bowl are all within a 30-minute drive. In warmer months, locals enjoy hiking, mountain biking, and boating and swimming in Lake Tahoe. Homes in Lahontan tend to be spacious — most with at least four bedrooms – and the majority were built within the last 15 years. According to MLS data, single-family home sales in the neighborhood between January and May of this year have ranged from $1.1 million for a 3,300-square-foot home to $2.4 million for a 5,700-square-foot property. Lots are also available, with sales prices this year ranging from $140,000 to $318,000. According to one of Pacific Union’s top Lahontan real estate professionals, homes in the community typically sell for between $400 to $600 per square foot. She adds that the pace of sales has been brisk this spring and that both vacation homebuyers and Lake Tahoe area locals are purchasing properties in the community.